You are here: Home / News / Featured Story / Should you raise the wipers or leave them down during winter storms? Should you raise the wipers or leave them down during winter storms? Some drivers raise their windshield wipers during a storm to keep them from getting icy. Iowans who follow the trend of leaving their windshield wipers sticking up during snowstorms likely aren’t doing themselves — or their cars — any favors. The rationale is that swinging the wipers away so they’re not in contact with the glass keeps the rubber blades from sticking, but an auto repair expert disagrees. Jonna Warner, manager of Freedom Tire and Auto Center in Des Moines, says it doesn’t make sense, especially in storms like Thursday’s. There’s also the risk of cracking the windshield, should a wind gust slap the wiper back into place. Plus, if there’s heavy snow, the wiper salute maneuver won’t do any good at all. 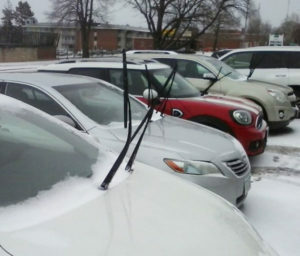 Warner suggests motorists leave their wiper blades in place and try an alternative. Warner says, “There are lots of products on the market that you can treat your windshield with at this time of year that will prevent or make the ice that builds up not so much.” Aquapel is one such product that can be wiped onto the windshield that prevents rain, snow and ice from pooling or forming on the glass. “In my opinion, that’s the best one out on the market,” Warner says. “Rain-X is another one and if you like doing methods at home, mixing vinegar and water works as well.” Another option would be to use a windshield cover, some of which are held in place by magnets or suction cups, keeping the glass free of snow and ice.